Beautiful, but not to be underestimated. 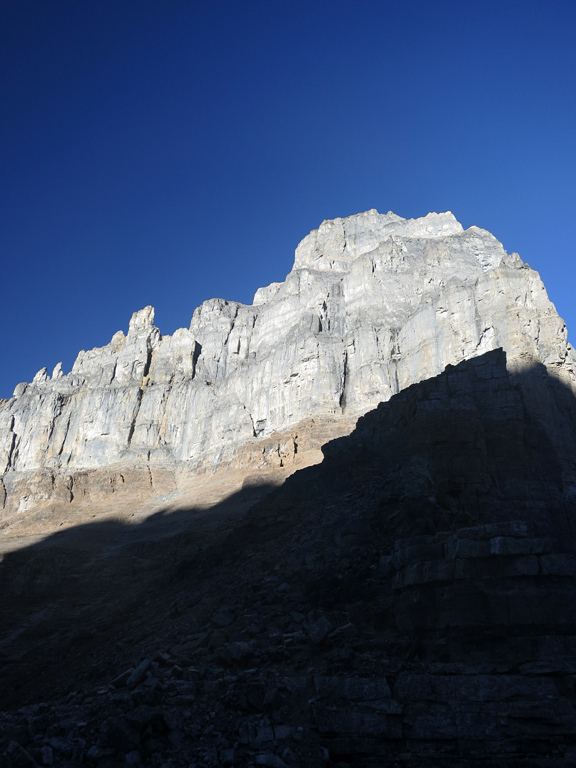 A long day with moderately difficult cliff band mid-mountain. 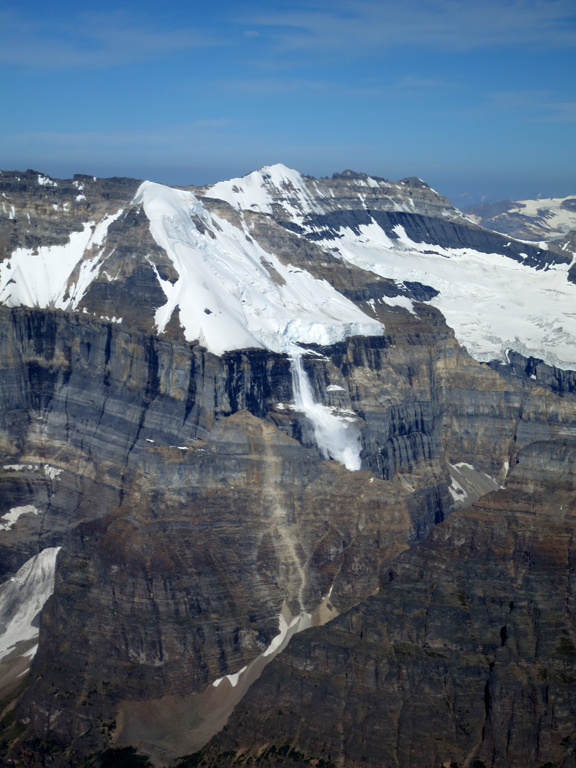 Rockfall, cornices near the summit, and sudden weather changes are hazards to expect. 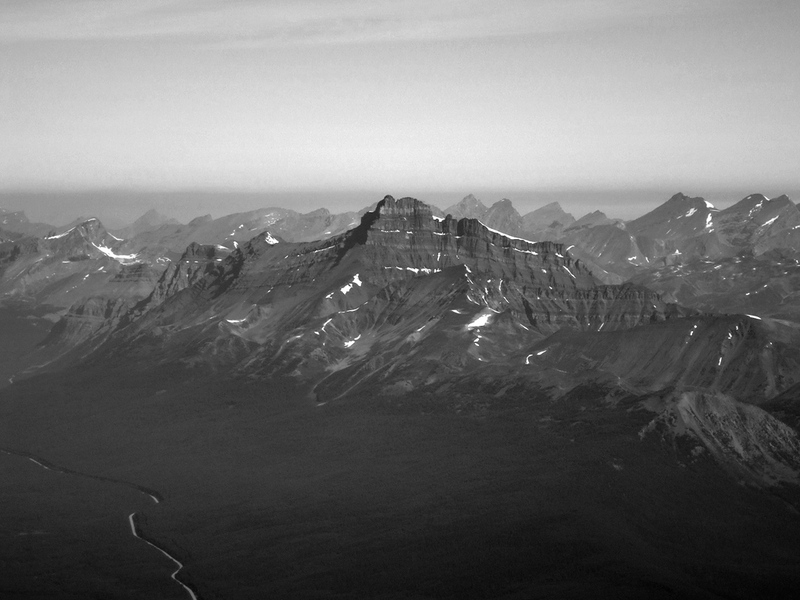 In a region blessed with ridiculous amounts of natural beauty, Mt. 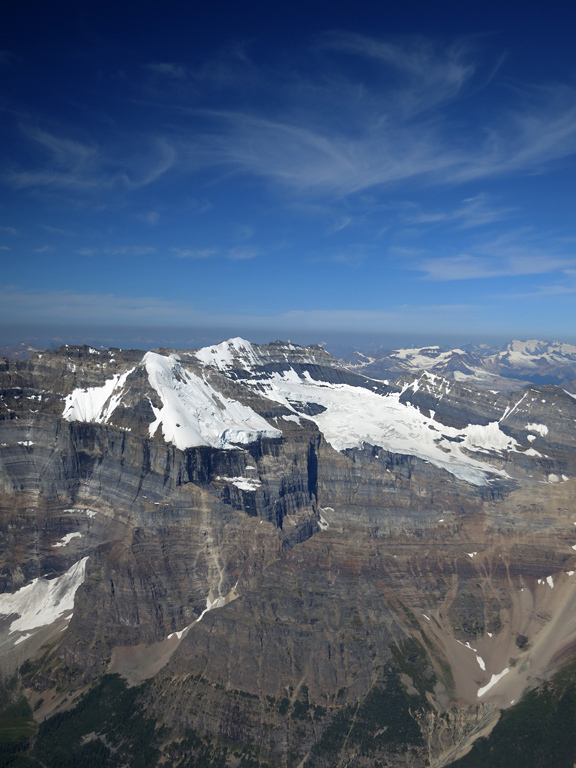 Temple stands alone as the tallest mountain in the Lake Louise Group, and visible from almost every other peak within a 50km radius. 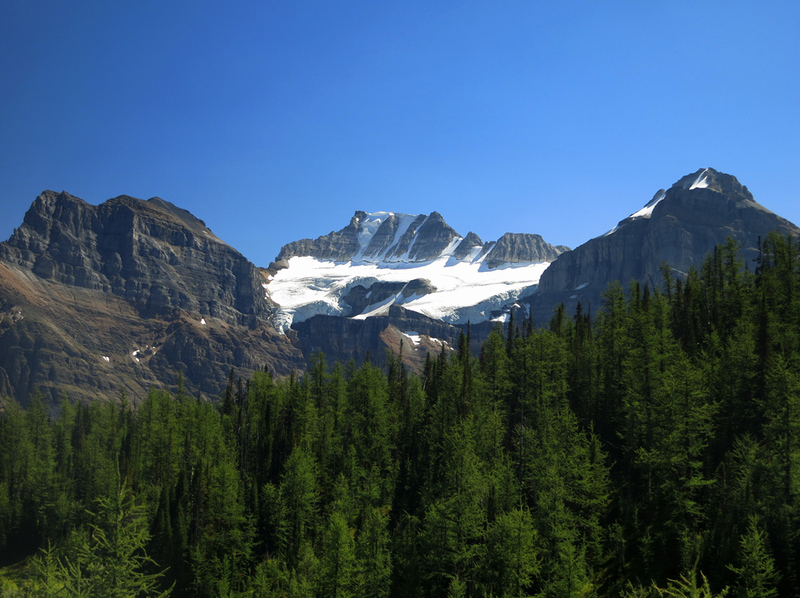 The name of the mountain is most appropriate; the first time I saw Temple, it was from across the valley at the Lake Louise Ski Resort on a brilliant, sunny, winter day. The base of the mountain was shrouded in clouds, while the rest of Temple's massive form soared impossibly above the rest of the landscape. 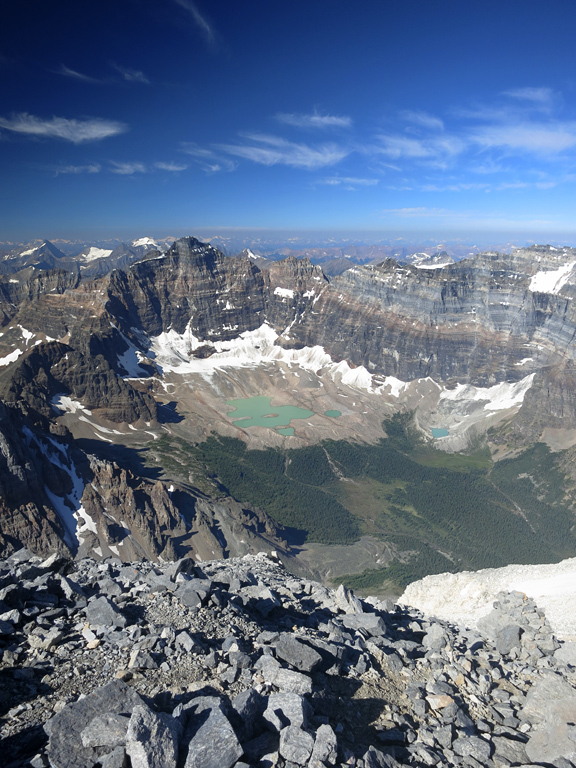 Unsurprisingly, Mt. 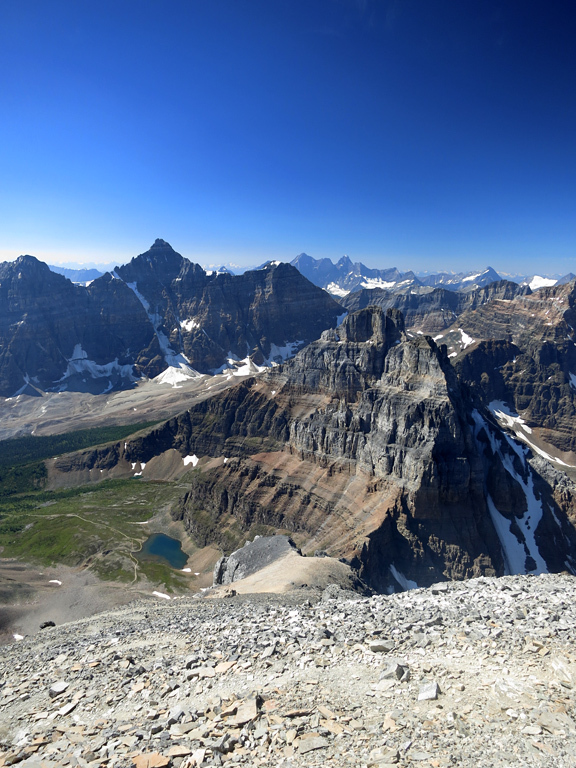 Temple is one of the tallest mountains in Alberta (ranked #6). 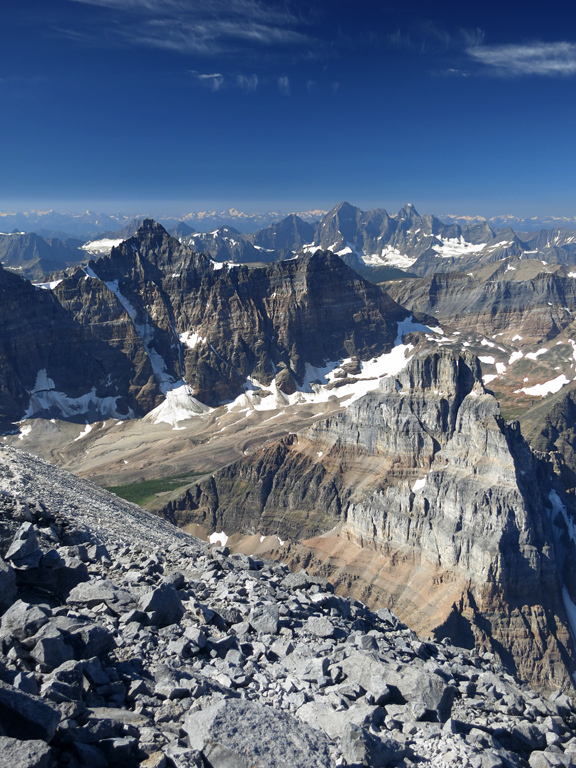 However, what may surprise many, especially those viewing Temple’s intimidating east and north faces, is that the mountain is also the tallest mountain in Alberta that can be scrambled. Well, perhaps even that's not that surprising as, unfortunately, the mountain is a bit of a tourist magnet. In fact, the “hike” up Mt. 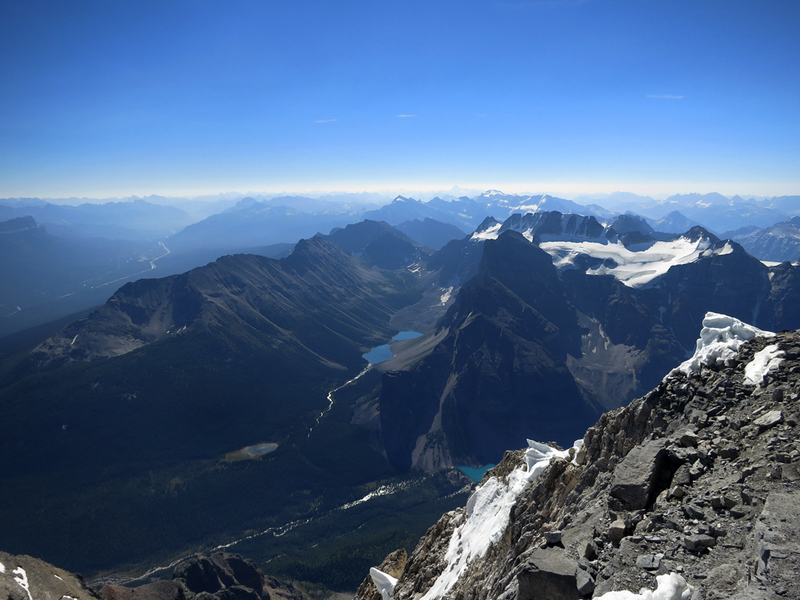 Temple is so popular with tourists and the otherwise unprepared, that Parks Canada felt it necessary to publish an ascent guide for Temple in an effort to reduce the number of rescues they need to perform. 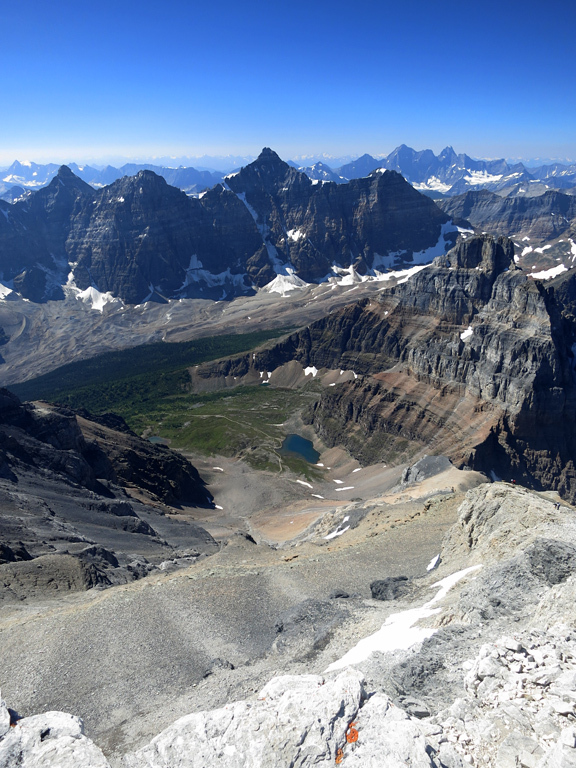 I don’t mention that to discourage those who, like me, are drawn to this peak by its solitary beauty and the absolutely breathtaking views it affords of the region; but this is classified as a moderately difficult scramble, that can present a number of significant hazards, and needs to be approached with a suitable level of respect. 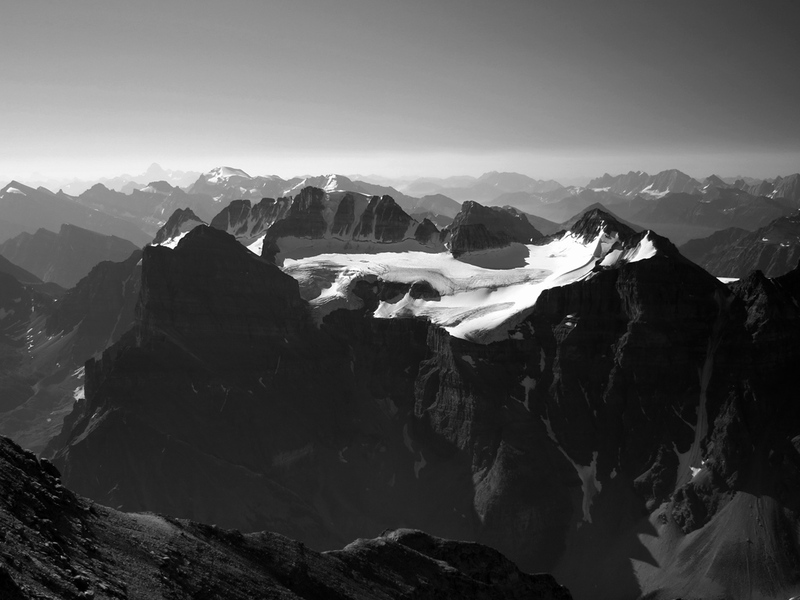 This isn’t another hike in the Lake Louise area; this is an ascent of an 11,627 ft. peak. Prepare accordingly. 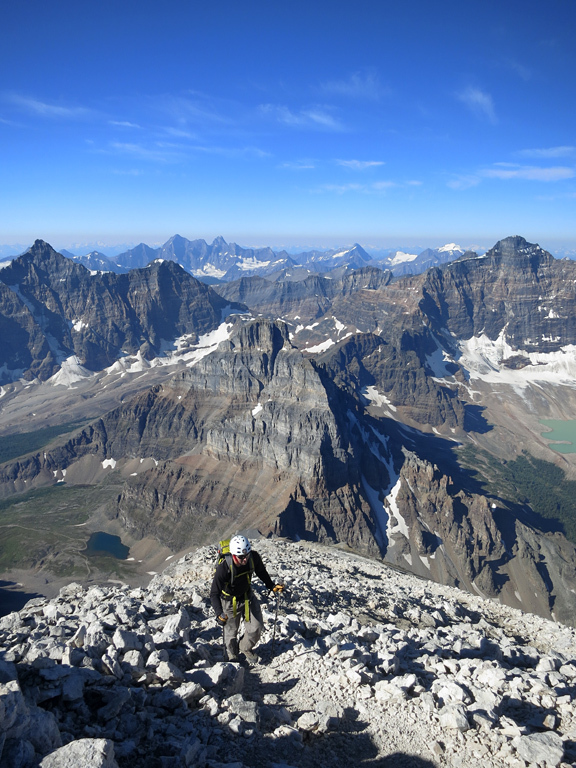 The scramble route for Mt. 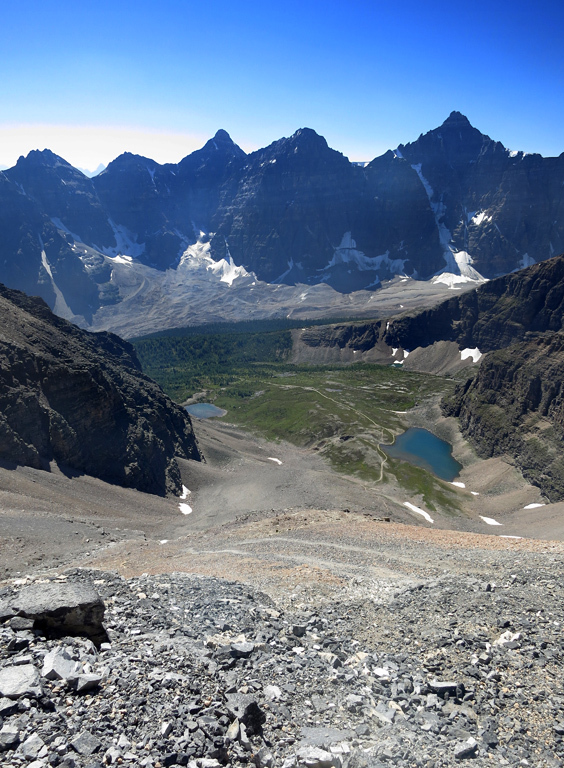 Temple begins from the Moraine Lake parking area. 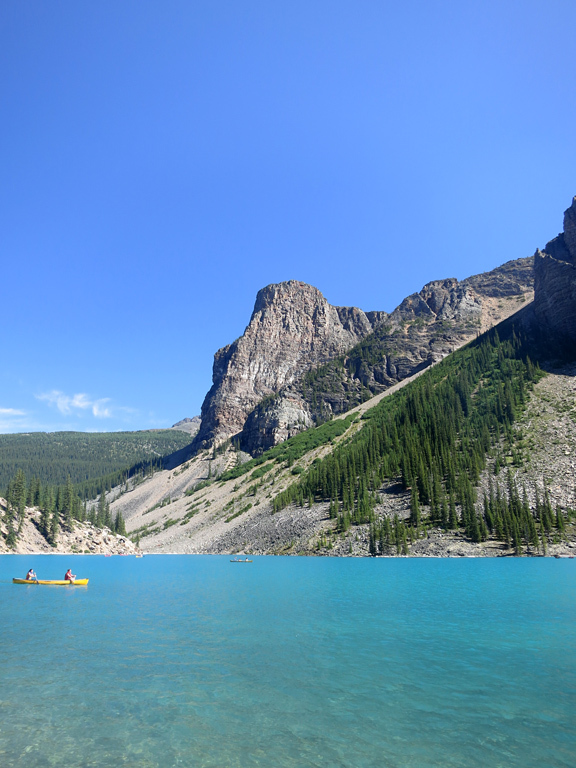 To get there, follow Lake Louise Drive west from the Village for 2km and then turn left onto the Moraine Lake Road. It’s important to note that this parking area is notorious for filling quickly, and it’s not uncommon to see vehicles parked along the approach road for a kilometre or more. You’ll want to make an early start for Temple (probably no later than about 7:00am on a summer day with a good forecast), not only to ensure a parking spot, but also because the trip will take at least 8-10 hours to complete. 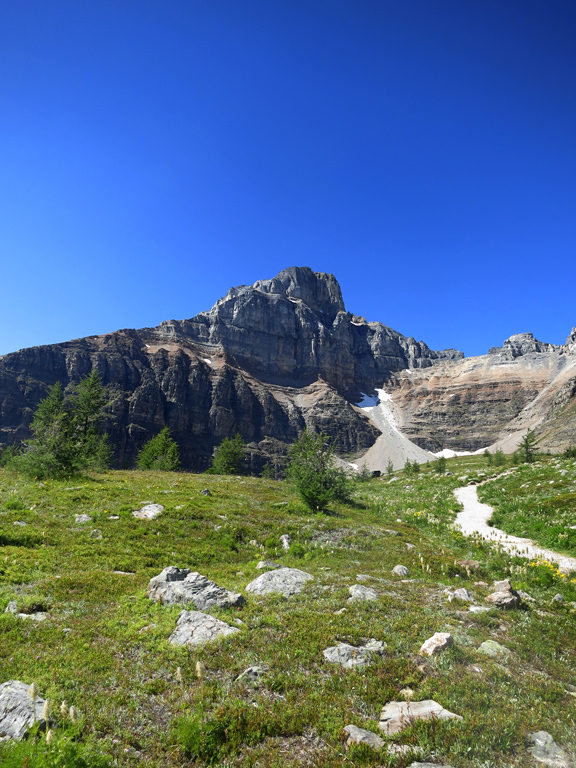 From the parking area, you’ll want to find the trailhead for Larch Valley, which is quickly reached by walking around the left (or lake) side of the day lodge and past the docks where visitors can rent canoes. Depending on the time of your visit, there will most likely be a group-size restriction in place for the use of the trail (see “Considerations” below for details). 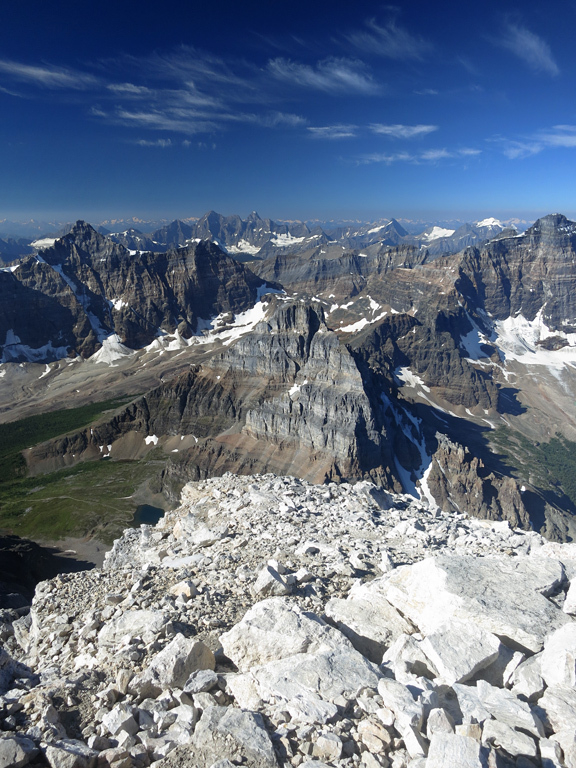 Because the Parks Canada guide provides an excellent outline of the climb, I’m merely going to elaborate on a couple of points. The first involves Step 5, which is the crux area of Temple. The prescribed route leads up to two surprisingly vertical 3m steps that have marginally positioned holds (as seen here). 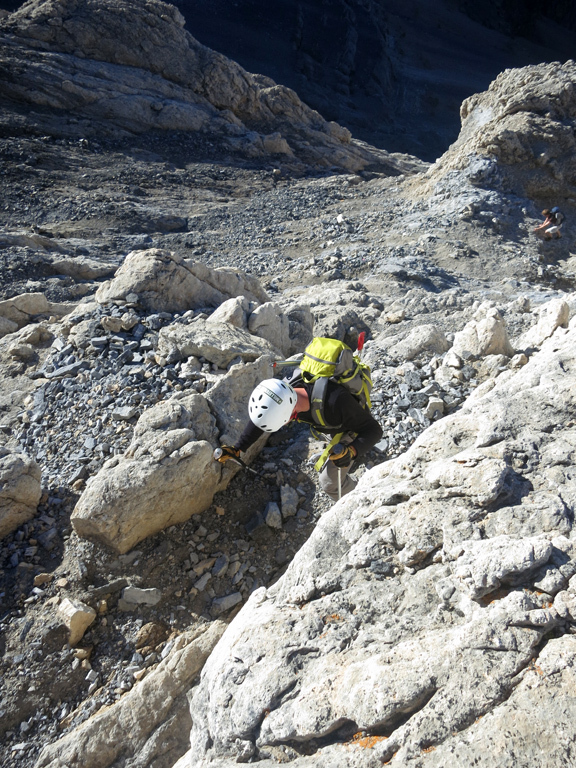 This is borderline difficult scrambling, and Ryan and I had to exercise a lot of care during the downclimb. I can’t believe that this is the recommended route; although I find it funny that the brochure suggests setting up a rope and a belay here. 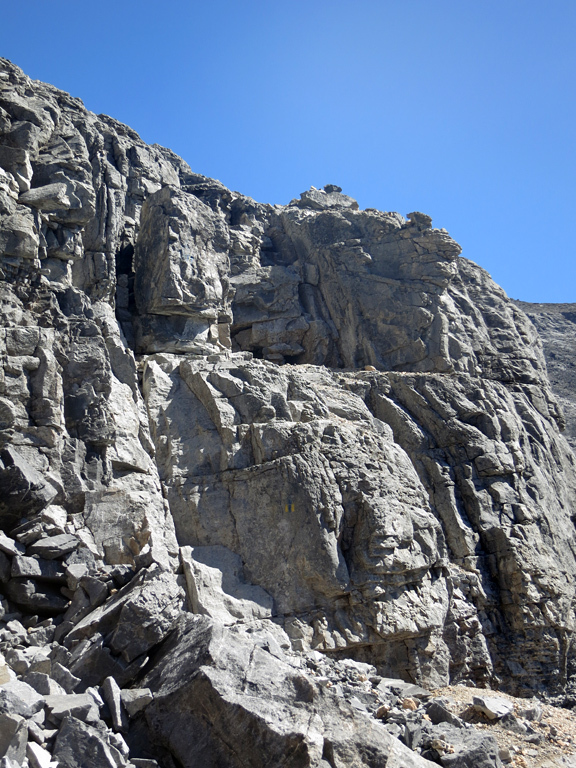 What you want to do is scramble up (and then later, down) a much easier route to the immediate (climber's) right of “Gully 2” (as pictured here). 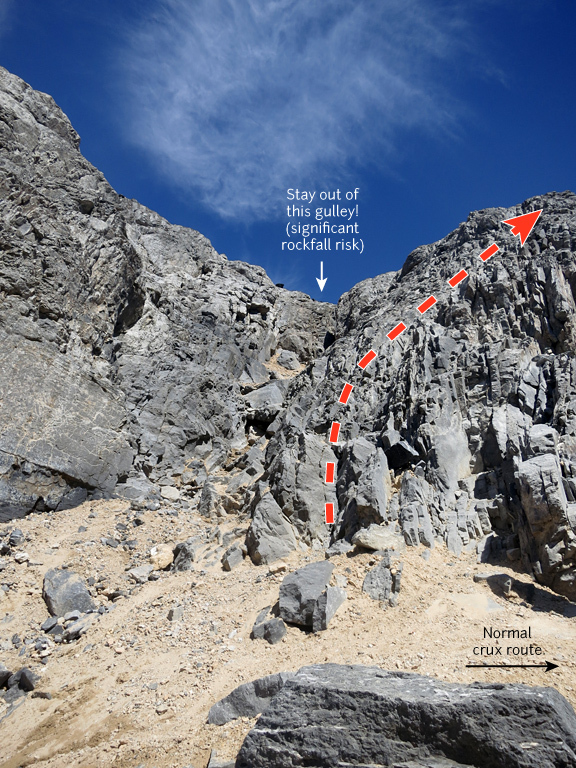 Note that the rockfall danger warning for Gully 2 is *completely legitimate*, as even careful steps around its top will send a lot of material down the mountain. 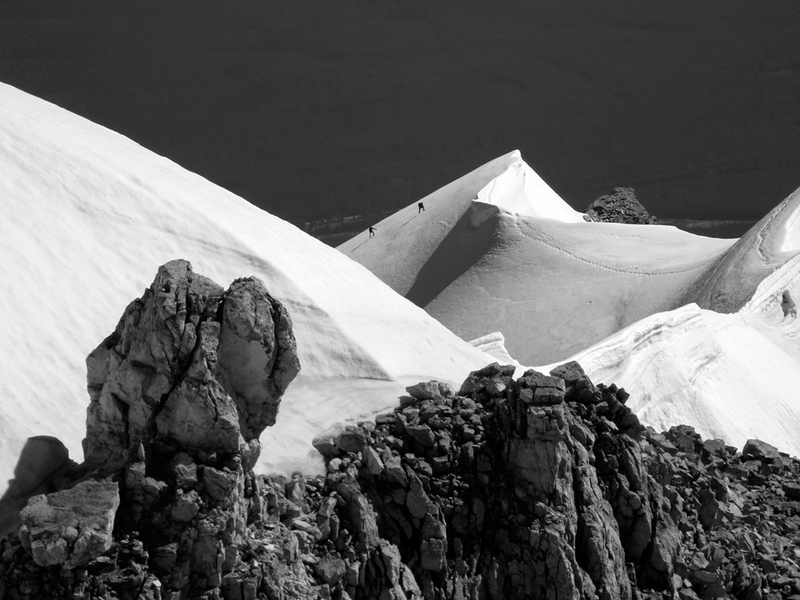 Do not attempt to ascend that gully, and be sure to spend as little time as possible near its path. 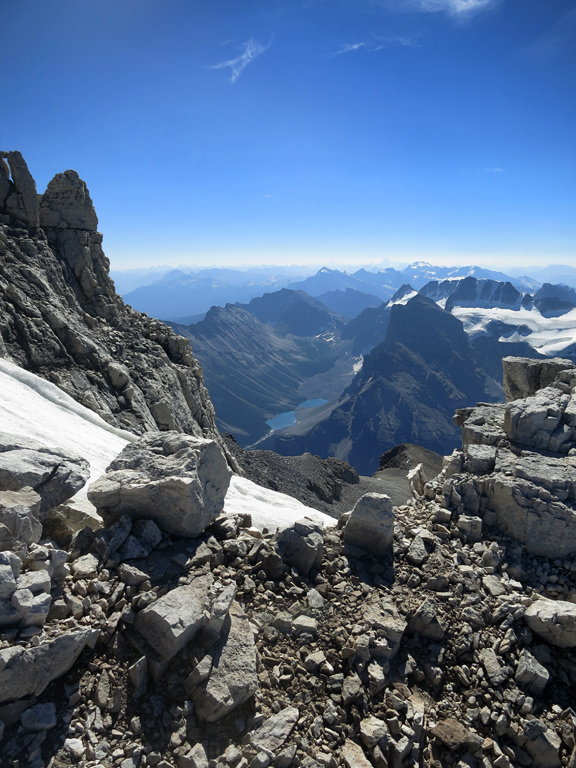 If you’re a scrambler of reasonable experience, you’ll definitely want to descend via the two scree paths identified in the main photo below Step 4. 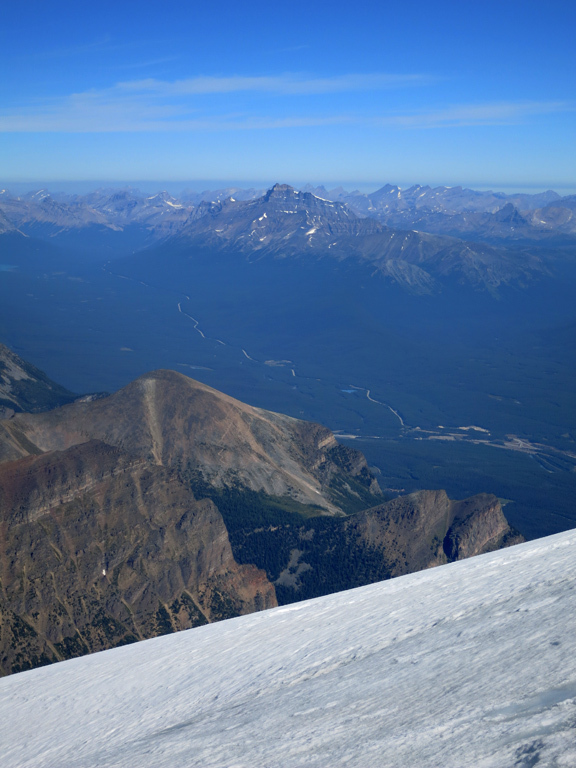 You can plunge step quite easily down this slope, likely saving yourself 30-45 minutes in the process. However, there are two things to note about this route. 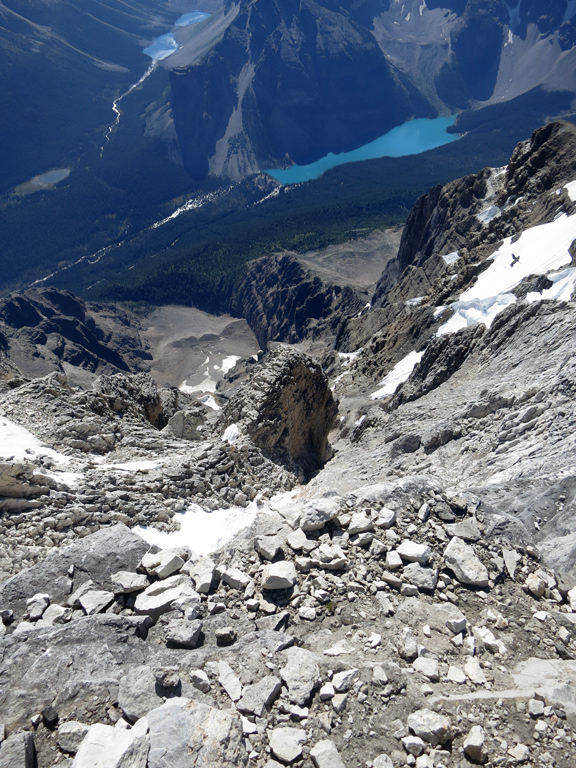 First, the debris path from Gully 2 continues through this area; it’s easy to identify, and should be avoided by staying to the skier’s left of it. Second, once you’re about halfway down you’ll be presented with a choice of routes: you can downclimb a dry (at least for us) waterfall section directly ahead of you, or continue through some rougher scree to the skier’s left. 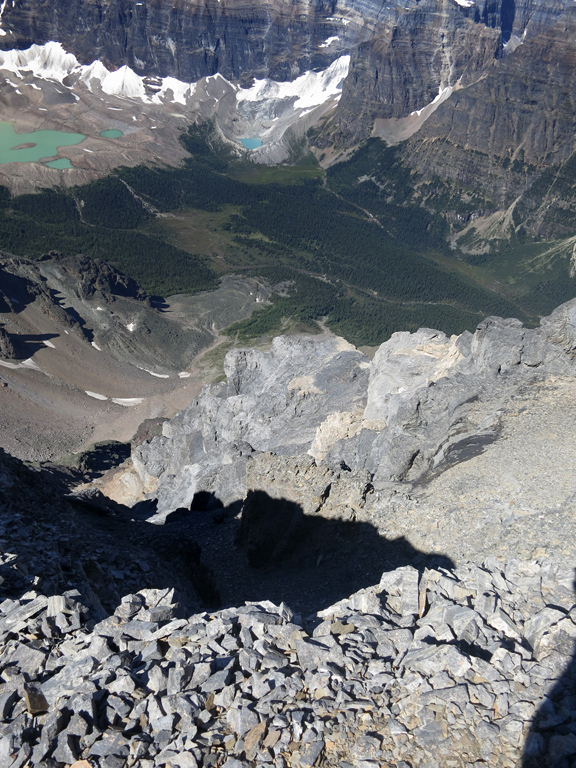 The scree route is faster, but the waterfall route (seen here) is fun to descend; offering great scrambling on rock that's simultaneously smooth yet grippy. 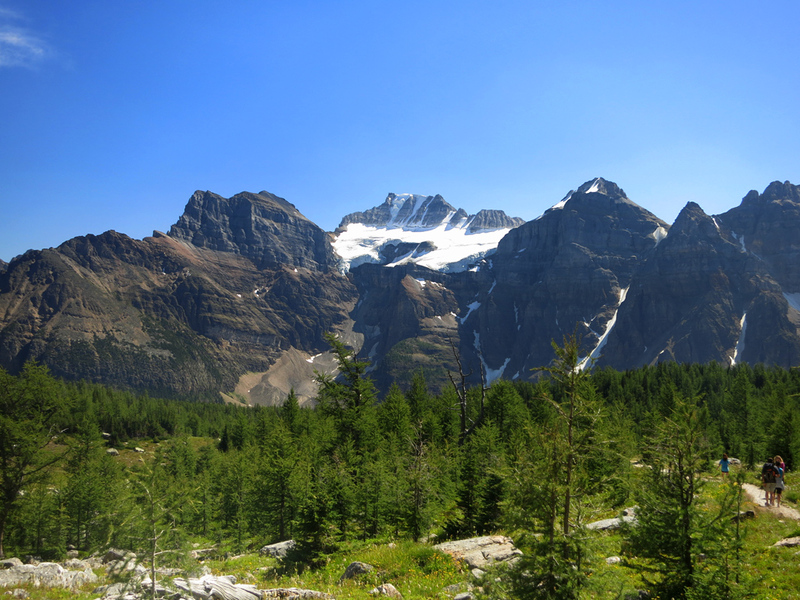 Either way, you’ll soon be back on the trail headed for Larch Valley. Due to both its altitude and geographic location, Temple has a limited scrambling season that usually spans from mid-July through September. 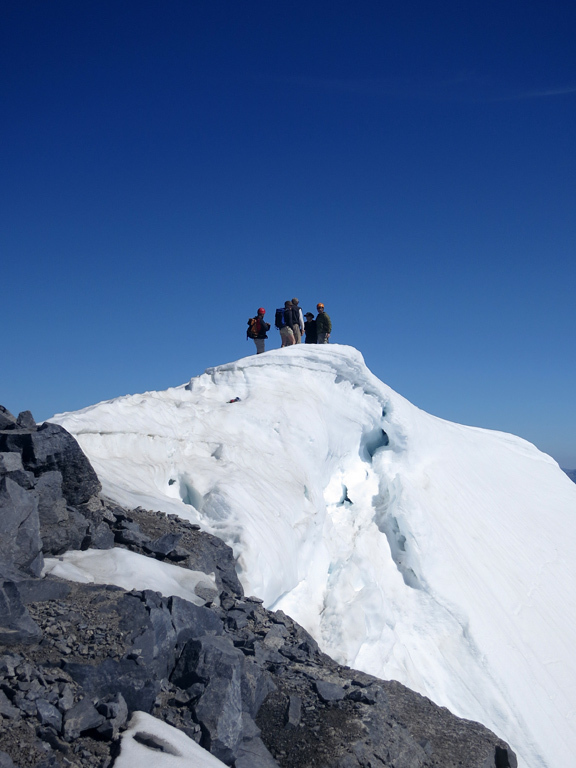 Attempting to ascend the scrambling route outside of this period increases the chances of encountering significant snow and ice conditions towards the summit, along with cornices which may be difficult to see while on route; all of which would elevate the difficulty of this climb into mountaineering territory. 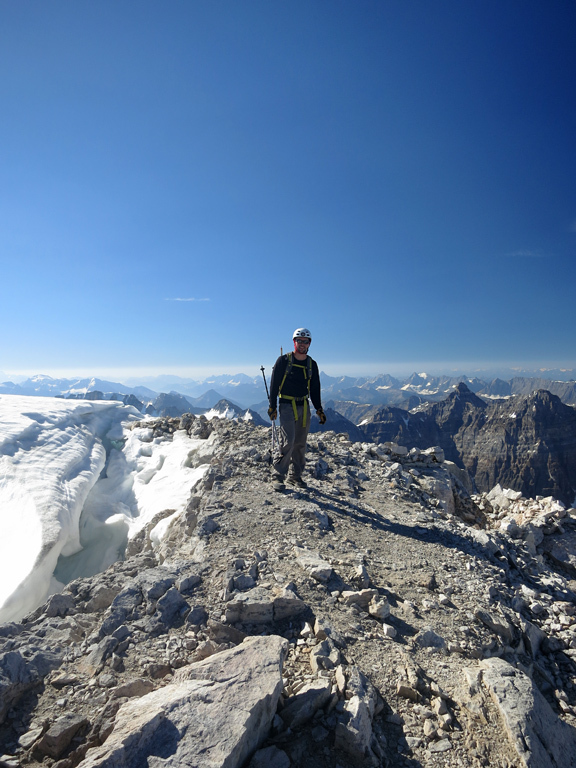 Note that even in August, Ryan and I had our ice axes with us as a precaution. 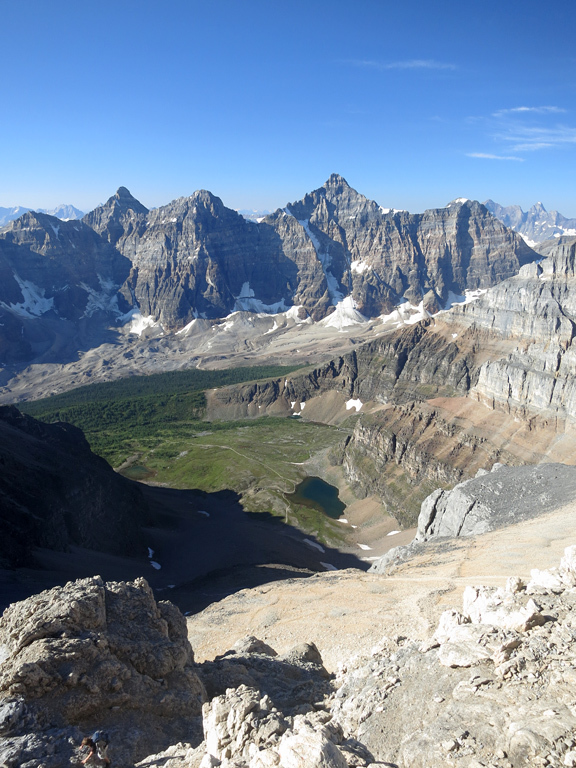 Every year, Parks Canada enacts a minimum group-size restriction of four people for trails in the Moraine Lake area to protect people from — and to reduce the impact upon — the local bear population, and it usually begins right around the start of Temple’s scrambling season. 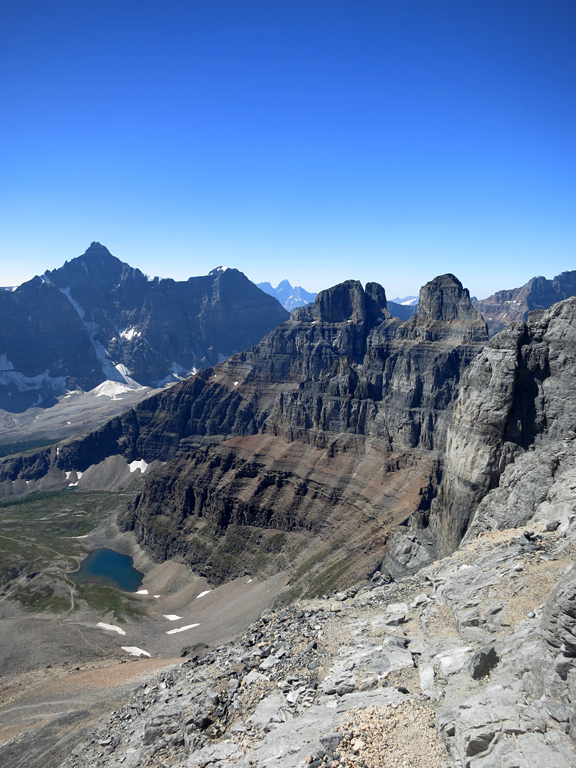 As it can be quite difficult to assemble a team for a scramble at the best of times, a useful tactic is to join hikers headed towards the Sentinel Pass area, ascend Mt. Temple, and then look to join another group after your descent. Can you get away with fewer people? Probably, but you could face an expensive fine should you happen to cross paths with a Warden. 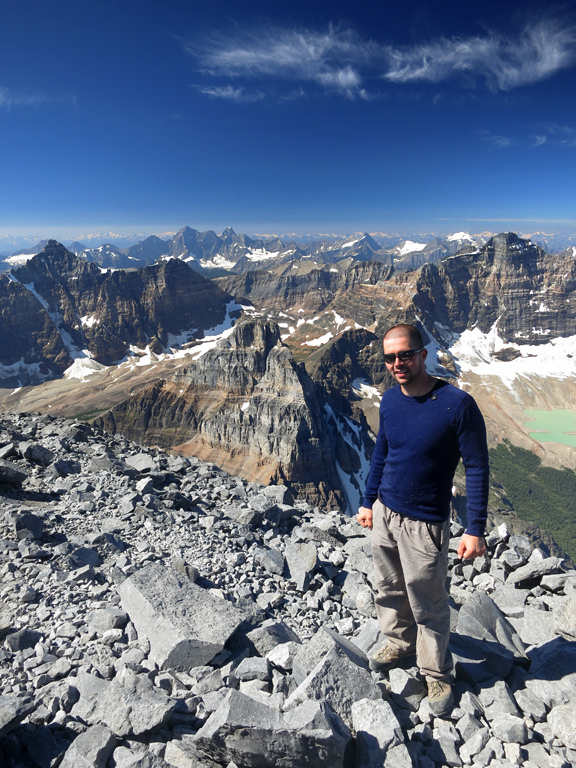 On a busy day, it’s very likely that you’ll see people (and perhaps many) headed for the summit with nothing more than tennis shoes, a pair of shorts, and a t-shirt... no water, no food, no extra layers, no head protection, no sunscreen, and sometimes, not even a camera! Please don’t be this abjectly stupid. The scree here will happily destroy casual shoes. 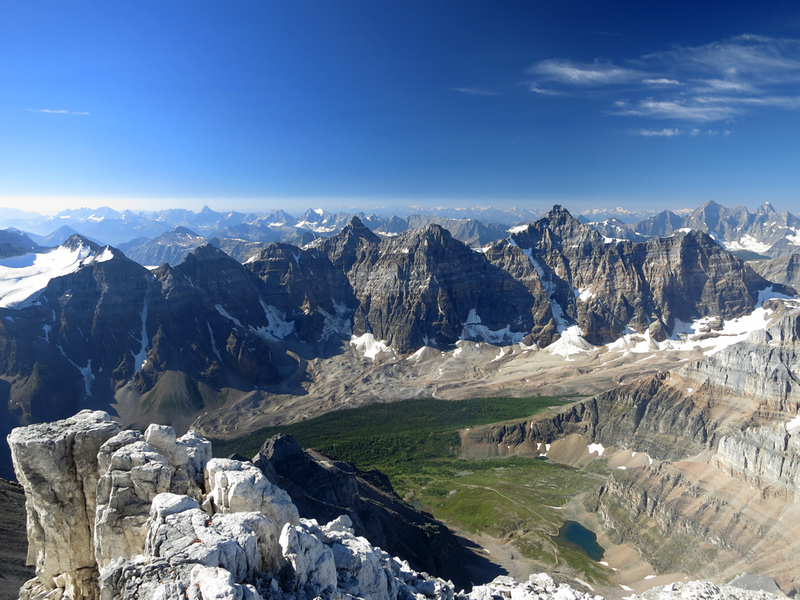 The temperature between Moraine Lake and Temple’s summit can vary by over 20°C, even before considering windchill. 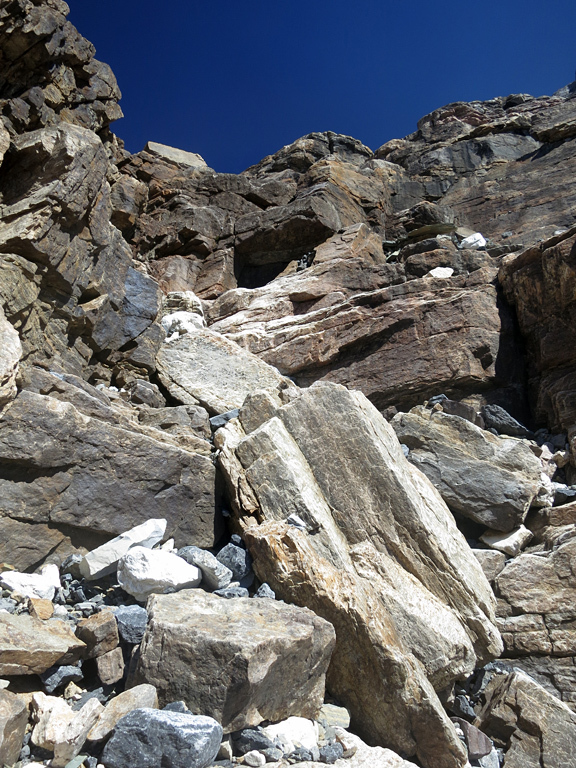 Many injuries on Temple are the result of rockfall, which can be a real hazard when there are dozens of people on the mountain — wear a helmet if you have one. Sudden afternoon thunderstorms can be quite common in June and July. 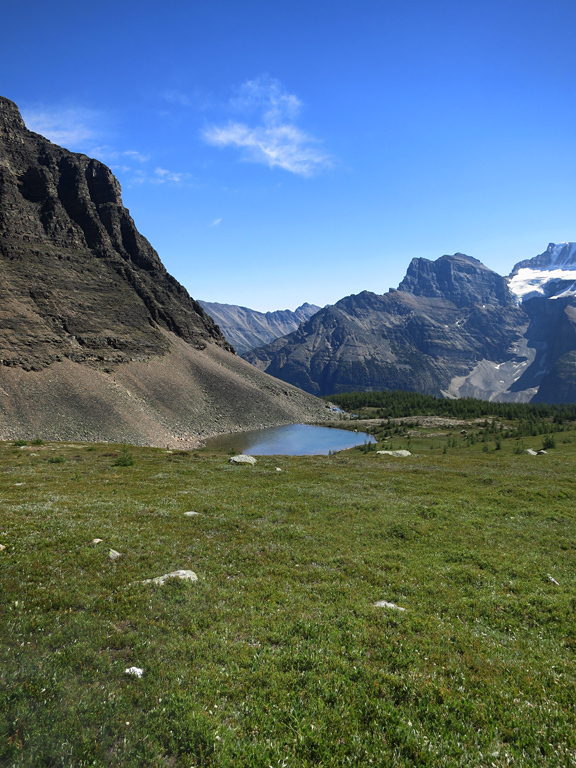 Quality water sources are non-existent along the route (only a few stagnant tarns and the occasional snow patch), so make sure that you have at least two litres with you. Lastly, you’re likely to develop a significant hunger during 10 hours of continuous physical exertion, so bring a lunch and some energy-giving snacks. The ascent of Mt. 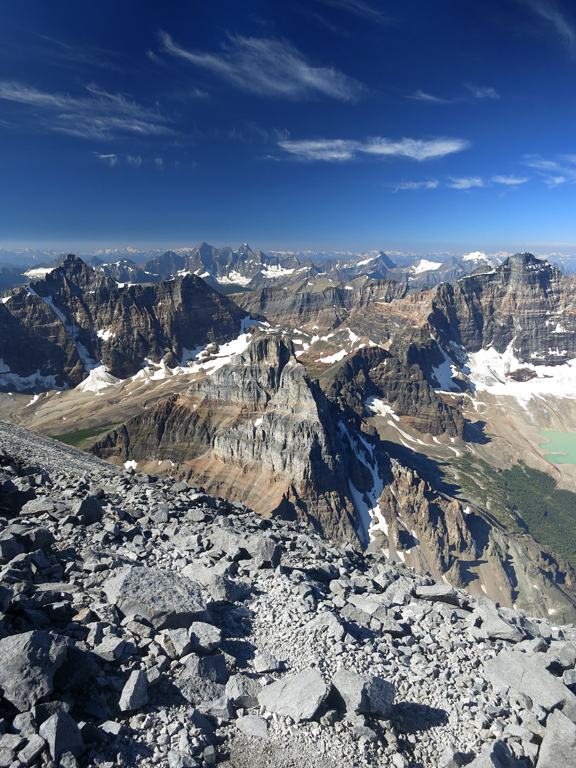 Temple is also described in Alan Kane's Scrambles in the Canadian Rockies (pg.235). 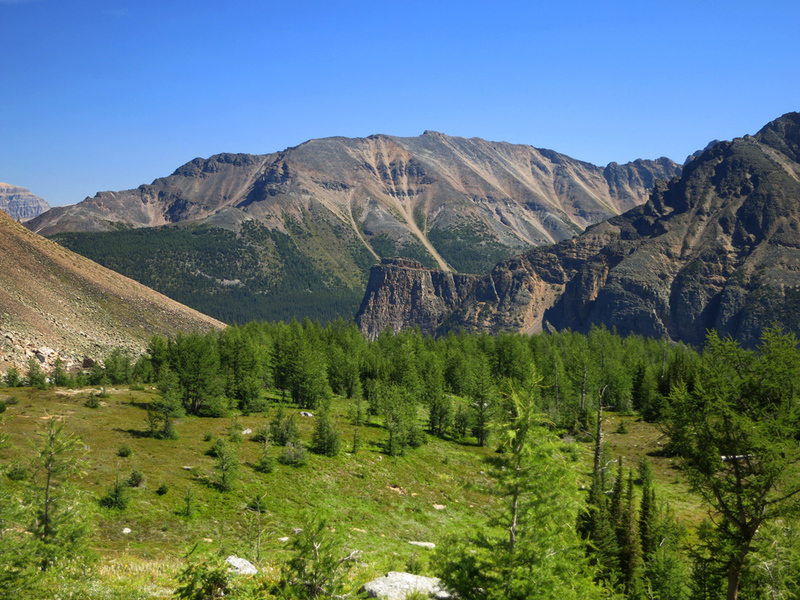 It's worth noting that the Parks Canada route is almost an exact match to that described by Kane. 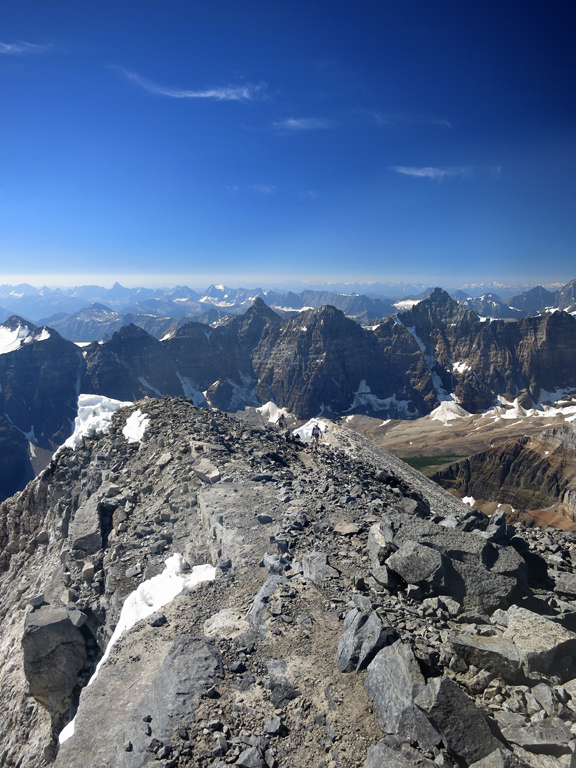 Summit: 3,162 m / 10,374ft. 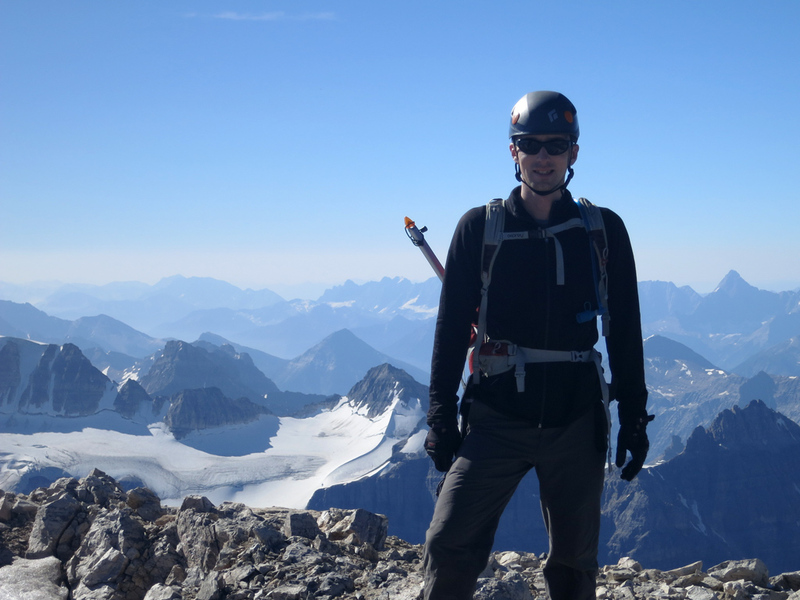 Summit: 2,748 m / 9,016ft. 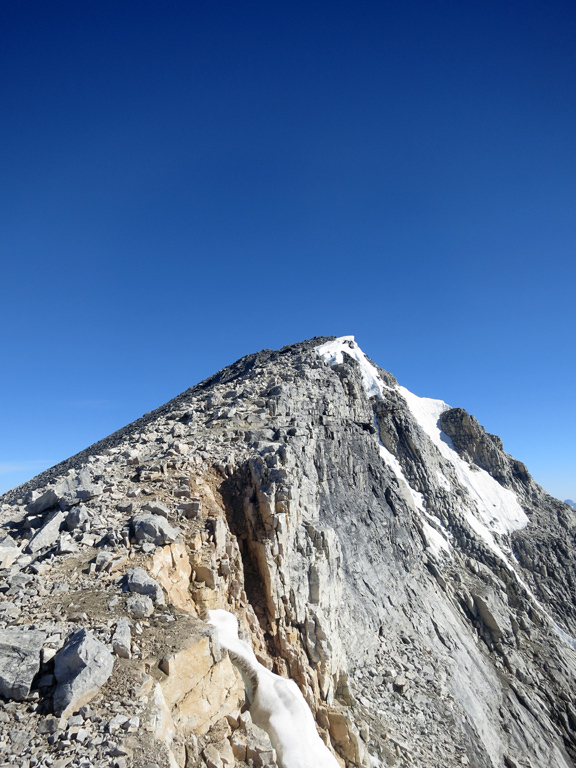 Summit: 3,394 m / 11,135ft.